It is here, Leo Santa Cruz vs. Abner Mares, tonight at 10pm US Eastern, on ESPN. The fight is for the vacant WBC Diamond featherweight title. Similar to Matthysse-Provodnikov, many are expecting a brawl. But Matthysse, who usually comes forward, spent the night boxing and backing away from Provodnikov who was known for his technical ineptness of defense and footwork. 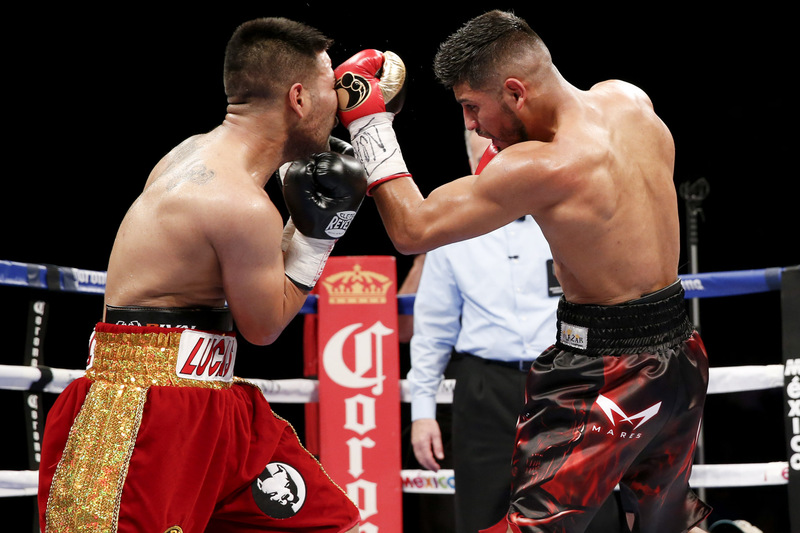 So too, it was not an accident that Mares (29-1-1, 15 KO) was knocked out by Jhonny Gonzalez. Attempting to trade with Gonzalez, he was rightfully caught by a left hook. When he was hurt after the first knockdown, instead of parrying and slipping Gonzalez's offense, he again tried to trade blows with Gonzalez. In his last fight, he also attempted to trade punches but benefited from the fact that he was a tad faster and punched harder than his opponent. But even then there were sequences where Reyes threw a punch at Mares, and Mares would unguard his face to loop a punch of his own, allowing himself to get hit in the face, relying on the crutch that he had his chin tucked. Mares demonstrates the clear difference between countering and trading. Countering involves hitting while evading. Straight away, I do not think Abner Mares is very technical. If Mares-Santa Cruz does end up becoming give-and-take, it is Santa Cruz (30-0-1, 17 KO) who is to blame. Cruz, who also likes to move forward, would do well in fighting off the back foot against Mares. Mares is three inches shorter, his reach three inches less, and there is nothing that he does well technically that would make one believe that he would slip punches and land at amazing angles against a superb boxer. The cloud of doubt shrouding Santa Cruz is whether or not he can hurt Mares. Cruz last fought as the lead in to Mayweather/Pacquiao against an opponent who was not a full time boxer. Cruz was able to do what he wanted, besides get the knockout. As flawed of a strategy as it would be, it benefits Mares to get into exchanges because his hands are faster. Santa Cruz needs to alter his usual high-volume approach which caters to exchanges. Instead, Cruz needs to be selective, control the distance with his jab and pop Mares with the straight right hand. Another small tweak that would solidify Cruz's advantage is that his upper body is too square to his opponent. He would create more distance between himself and Mares by angling his upper body more, which in turn would benefit his offense by putting his lead jab hand in a more obstructive position and allow him to get more upper body rotation on his straight right hand. Lastly, Cruz needs to avoid letting his forward momentum bring him into the range of exchanges with Mares. Mares needs to keep the fight on the inside where his compact physique is primed to generate more power than the longer and lankier Santa Cruz. In close-range exchanges, Santa Cruz should wear and tear more quickly. It is here, Leo Santa Cruz vs. Abner Mares, Saturday, 10pm US Eastern, on ESPN. The fight is for the vacant WBC Diamond featherweight title.